Purrball and Burrball are emblematic of the animal life that is so worthy of our love and care. In beautiful ways, children’s authors portray both domestic and wild animals, they write about appreciation of the environment, travel, and much more. There are so many books to give homage to! Here you’ll find paw ratings from Purrball and toe ratings from Burrball on many great reads for you and your children. If you’ve ever lost a cat, Lost Cat may be harder for you to read than the author may think. I will always feel the pain of losing my cat (found alright weeks later) and find it one of the hardest things for me to think about. So, I’m a bit critical just based on my own horror of this situation, but Lost Cat is actually very sweet. A bit haunting for me to look at the cover and think of what my lost cat went through, but I think anyone without that gauge would enjoy this heartwarming story and smiply gorgeous illustrations. If you can’t please Santa, you should just BE Santa. 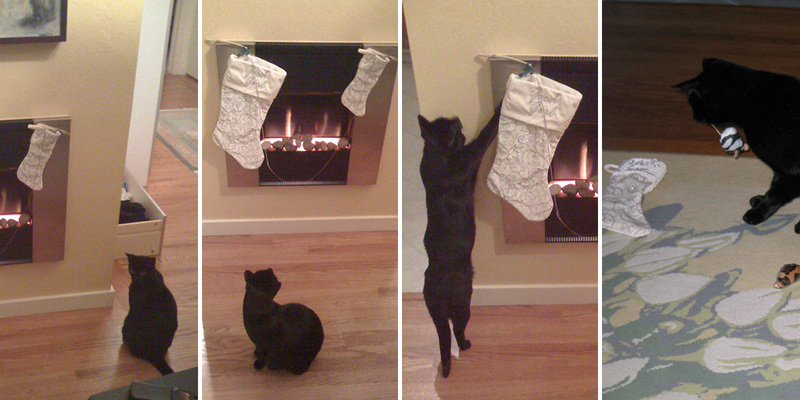 I picture one of my cats get that concept that he has been a bit more naughty than nice and he really ought expect nothing in his stocking (which of course happens in spades, whatever his behavior, see photo below of him opening his stocking before it is time). Here Comes Santa Cat, like all the holiday cat books I’ve read of Underwood’s, is just a riot. Your kids, you, and even perhaps your cats will appreciate this book! It has been released in paperback today (October 4, 2016) as well.